Breakthrough Santa Fe wins Piñon Award for “Courageous Innovation.” The tuition-free non-profit was just recognized by the Santa Fe Community Foundation for its “bold and innovative approach to solving a persistent problem in Santa Fe,” one of four non-profits honored this year at a ceremony on October 8th at La Fonda. Each non-profit awardee received a promotional video as well as a small grant from the Foundation. The entire Prep community shares in Breakthrough’s accomplishments. Now in its 10th year, Breakthrough Santa Fe serves students from the Santa Fe Public Schools who dream of a college education. In a district where only 23% of high-school freshmen will matriculate in college four years later, Breakthrough students need the support the program provides: rigorous summer classes, student advocacy, and one-on-one college counseling. And so far Breakthrough has been very successful: 92% of graduates go on to attend college, 86% of whom will be the first in their families to do so. But Breakthrough is about much more than the numbers. Its method of narrowing the college access gap is different from similar programs in Santa Fe. Breakthrough sets itself apart by recruiting a group of 30 6th graders each year and sticking with them until they matriculate in college. The program’s services are catered to its students’ changing needs: middle schoolers participate in an immersive summer program with advanced academic classes and plenty of team-building activities, while high school juniors and seniors prepare for the ACT and receive help on college and financial aid applications. And throughout, Breakthrough provides a “college-going family” for our students: a group of like-minding young people who support each other when the path to college gets rough. Breakthrough recruits high school and college students as classroom teachers for its summer and school year program, many of whom were students in the program themselves. “I am most grateful for having young teachers,” said Arianna Padilla, an 8th grader in the program, “because they can really relate to me and they teach me in ways that I understand.” These young adults are more than teachers: they are mentors and role models, proving to Breakthrough students that it is indeed possible to make it. Finally, Breakthrough is innovative in the way it brings the private and public sectors together. 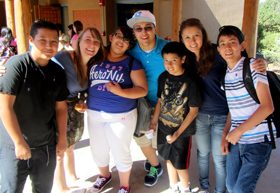 Since its founding, Breakthrough has been a partnership between the Santa Fe Public Schools and Santa Fe Prep. Breakthrough works closely with the district to recruit and support its students, and Santa Fe Prep donates classrooms, office space, transportation and the director’s salary to the program at no cost. In addition, many Prep students and parents volunteer their time to work with individual Breakthrough students. This year, 15 Prep high school students are doing their TAP at Breakthrough, and several Prep parents and teachers are tutoring struggling Breakthrough high schoolers. If you are interested in getting involved with Breakthrough, please contact director Talia Winokur.